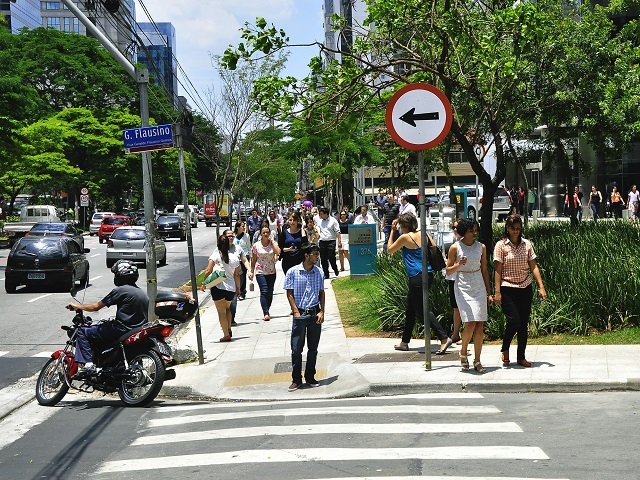 As a part of São Paulo’s transport demand management (TDM) strategy, the city is partnering with private companies to reduce the number of cars on the road, making streets more people-oriented. Photo by Mariana Gil/EMBARQ Brasil. A century of car-centric urban development has left our cities polluted, congested, and searching for sustainable solutions. Transport Demand Management (TDM) strategies can provide these solutions by combining public policy and private sector innovation to reverse over-reliance on private cars. The Moving Beyond Cars series—exclusive to TheCityFix and WRI Insights—offers a global tour of TDM solutions in Brazil, China, India and Mexico, providing lessons in how cities can curb car culture to make sustainable transport a reality. São Paulo’s population is growing—and so is its traffic congestion. Residents of South America’s largest city take more than 43 million trips daily, nearly 30 million of which are in vehicles, mainly private cars. São Paulo‘s average commute time by car is around 1.5 hours, and the productivity lost to traffic congestion is equivalent to 7.8 percent of the metro area’s GDP. As the city continues to grow, leaders know that commuters will need a better, more sustainable way to travel. Reducing the number of cars on the road through transport demand management (TDM) offers a promising solution. WRI, EMBARQ Brasil, and the World Bank launched a TDM pilot project in 2012 in one of the city’s most congested areas, along the Pinheiros River. The first-of-its kind in Brazil, this pilot project worked with 20 companies that draw in a total of more than 1,000 employees daily. At the onset of the project, more than half of those employees drove to work alone, while fewer than 20 percent used public transport. By the end of the initiative, the number of employees driving to work by themselves dropped by 17 percent, and the number of public transport users rose by as much as 10 percent. Businesses involved in the project pursued three big changes—creating benefits for themselves, their employees and the city at large. Historically, many employers in Brazil have not felt they have a role in addressing employee commuting beyond providing and/or paying for parking. The responsibility to improve overall mobility lay solely with the public sector, they thought. So researchers helped companies participating in the pilot project collect data about how much long commutes cost their businesses. Once companies understood the economic impacts of traffic congestion, they were keen to pursue solutions that supported cycling or walking to work, such as providing in-house shower and locker facilities. Companies saw an increased uptake in cycling to work amongst their employees, with staff citing improved health and well-being as a result. 2. Use incentives to overcome cultural barriers. For many Brazilians, owning a car demonstrates social status. Employers can play an important role in reversing this cultural barrier by providing education and incentives. Some employers with the pilot program launched company-wide education campaigns to promote more sustainable modes of transport. Companies supplied personalized commuting routes and mobility kits that mapped local transit stops and connections. Other employers discouraged private vehicle travel by providing financial incentives for using public transit or offering better-located or cheaper parking spots for carpoolers. Finally, the pilot project showed that sustained engagement was highest amongst companies whose leadership was involved from the onset of the project design and who understood the impact of mobility issues to a company’s performance. In companies where top leadership was not involved, TDM measures fell by the wayside over time. Leaders must demonstrate their commitment in order to secure long-term behavioral and cultural changes, by taking advantage of corporate mobility plans and taking alternative transit options into work. While TDM is an effective strategy to make corporate mobility more sustainable, implementing TDM measures does not come natural to Brazilian companies. Rather, it requires a fundamental shift not only in corporate culture and priorities, but also in government and city policy. And this takes time. WRI Brasil and EMBARQ Brasil are now expanding the pilot program into the multi-stakeholder Plataforma Conexões Rio Pinheiros, which unites 20 member companies and government organizations with other key players in the Rio Pinheiros district, with the aim to test, pilot and scale mobility solutions. This approach will be key for building a more sustainable São Paulo, which set urban mobility as a priority in its August 2014 strategic master plan. Specifically, the plan emphasizes curbing car culture and recognizes a fundamental link between urban mobility and quality of life. As the city’s master plan is considered a milestone for urban development in Brazil, we can expect solutions that work well in São Paulo to be replicated in other Latin American cities. If the congestion capital of South America can do it, why not cities across the world?